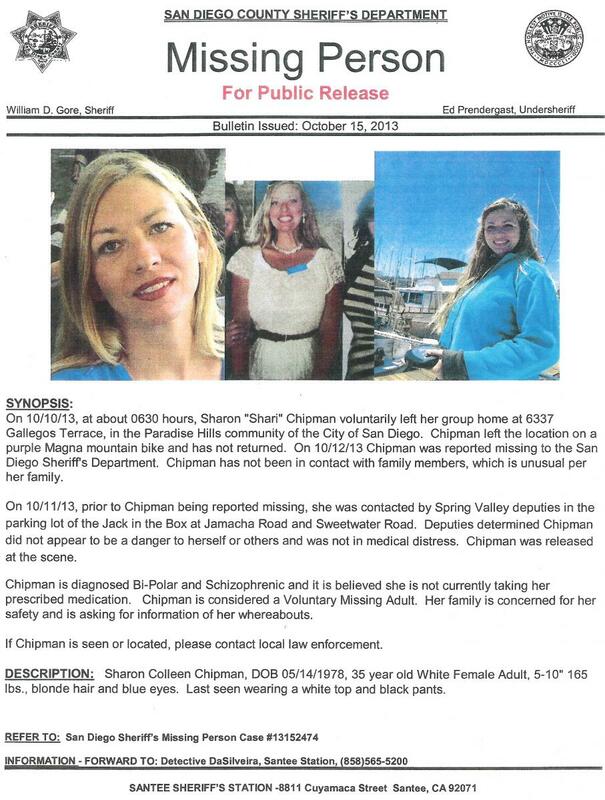 October 23, 2013 (Spring Valley) -- Sharon “Shari” Chipman, 35, from San Diego has been missing since Oct. 10. She walked away from her group home in Paradise Hills and was reported missing by her grandmother on Oct. 12. She left behind a cryptic note that said, "Leaving everything behind, Jesus told me to," Shari's brother David Chipman, told East County Magazine. She has been diagnosed as bipolar and schizophrenic. Her family is concerned for her safety. Sheriff's deputies talked to Chipman at the Jack in the Box on Jamacha Road and Sweetwater Road in Spring Valley on Oct. 11. Since she did not appear to be a danger to herself or others, she was released at the scene. Her family had not yet reported her missing; the Sheriff has since issued a missing person bulletin. Chipman also made a banking transaction in Spring Valley on Oct. 11. On October 18, a week later, her purple Magma mountain bike was spotted locked to a bike rack at a McDonald's near Sweetwater Road and Jamacha Blvd. David and his father, Steve Chipman, came from Texas to San Diego to hand out flyers. He wants Shari to know that she has a family that loves her and wants her back. He said there have been sightings of Shari on the Ocean Beach pier on Saturday night, as well as in Lemon Grove and Spring Valley. David wanted the public to know that because Shari has not taken her medication, she may be showing signs of an erratic and flamboyant nature. 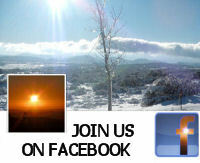 "The family wants to resolve the situation. If she is depressed, if she needs a cell phone, we will do anything we can to make her transition easier," said David. "We are here to help her and she can call her grandma's house and her family is waiting for her." The authorities are asking for the public's help in locating Sharon Chipman. She is 5'10" tall, 165 pounds with blonde hair and blue eyes. She was last seen wearing a white top and black pants. If you have any information on her whereabouts, please call the San Diego Police Dept. at 619-531-2000 and reference missing person case #13152474. You can download a flyer here.